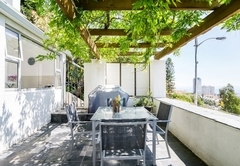 121 Ocean View Drive is a highly recommended property providing self catering in Green Point for up to 2 guests visiting the Atlantic Seaboard region. 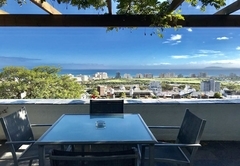 121 Ocean View Drive is a luxury self catering studio apartment situated in Green Point on the slopes of Signal Hill, with magnificent views of the ocean and the V&A Waterfront. 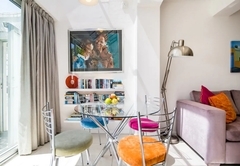 This is lovely large studio apartment (approximately 54 sq metres) with king-size or twin beds (extra length beds) fitted with superior quality percale linen. Sleeps maximum 2 persons. 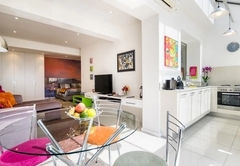 It is fully furnished and equipped with best quality towels and linen. Walk in closet with safe. 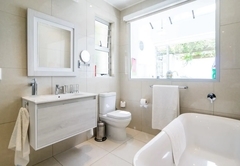 Bathroom with separate toilet, separate shower, bath and basin. The lounge area has a couch, satellite TV, DVD / video and mini hi-fi CD stereo system. The apartment is fully air-conditioned. 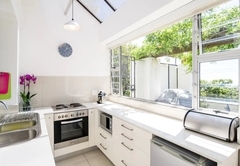 Fully equipped kitchen with oven, hob, fridge, freezer, microwave, iron etc. 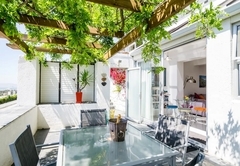 Large patio (approximately 20 sq metres) with stunning views, with table and chairs and barbeque. • Serviced twice a week (extra services available at extra cost). • Laundry service available at extra cost. • Swimming pool with magnifcent views available for the use of guests only. • No smoking in the apartment, but fine outside! • Airport transfers, car hire and tours gladly arranged. • Many restaurants, shops, bars and clubs a few minutes away. 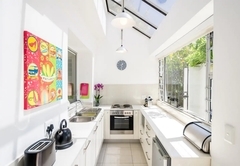 • Gym, golf, tennis, bowls and water sports nearby. • Table Mountain is a 10 minute drive away. • V&A Waterfront is a few minutes drive away. 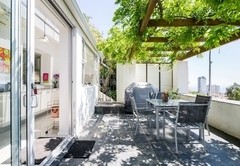 • Cape Town City Centre is a few minutes drive away. 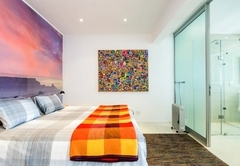 • Sea Point promenade and beaches within walking distance. 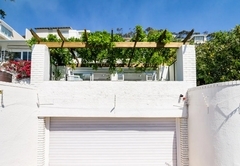 • Clifton and Camps Bay are a 7 minute drive away. • The airport is a 20 minute drive away. 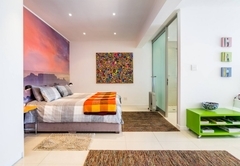 The stylish unit at 121 Ocean View Drive Studio Apartment comes with an open plan lounge area and kitchenette. It is fitted with air-conditioning and has a flat-screen satellite TV and DVD player. 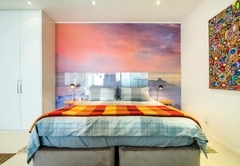 76 Reviews from SA-Venues.com travellers. All reviews are verified. We had a wonderful stay in this nice appartment at the Ocean View Drive. Both owners are warmly and helpful and also these two cute dogs were so familiar with us. 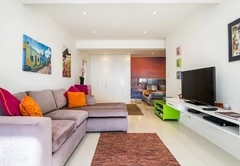 The appartment is equipped with everything what you need for your stay to make your stay perfect in Cape Town. 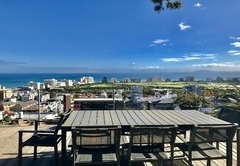 You have a wonderful view over the Table Bay to Robben Island, the Soccer Stadium and in the distance Blouberg Beach. 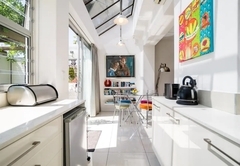 Shops and tourist attractions are only a few meters away from your host and there are more than enough parking lots around. You can also enjoy the owners swimmingpool and nice rest area above appartment with the fabulous view which you will hardly miss being at home. We really recommend this place to have your holidays there. Response time121 Ocean View Drive typically responds to requests in 5-10 minutes. Child policyChildren welcome, parents must bring own cots etc.